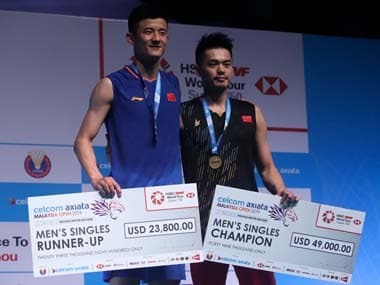 Shanghai: Lin Dan's defeat in the World Championship final has prompted fresh conjecture that the Chinese super star could soon call time on his brilliant career. "After that I have no plans," said Lin, indicating he might soon call it a day. "It will be difficult to play in the World Championships at 34." But the two-time Olympic and five-time world champion, regarded widely as the greatest singles player of all time, mixed his message by adding that reaching the final against a player 10 years younger "showed that I am still strong enough physically". Lin was the bad boy of Chinese sport in his younger days, with a rap sheet that included hitting a coach. And he has hinted at retirement before, only to plough on. Lin proved his enduring quality in Scotland by beating South Korea's World No 1 Son Wan-Ho in the semi-finals, before going down to the 23-year-old Axelsen in what felt like a changing of the guard. "It is unbelievable to beat Lin Dan, I have been watching him for years," said the Dane. As he nears the end of his career, Lin has been cherry-picking his tournament appearances to help extend his time at the top, like 36-year-old Roger Federer who has enjoyed a resurgence this year to win two tennis grand slams. Lin has fallen to seventh in the world rankings and fans on China's Twitter-like Weibo, where he has 3.75 million followers, said he lost the final to Old Father Time rather than his Danish opponent. "The best players will always lose to time/age in the end. Even in defeat Lin Dan deserves to be honoured and respected. You will always be Super Dan," said one. But many were more concerned with Lin's love life which has made more headlines than his badminton in the past year. 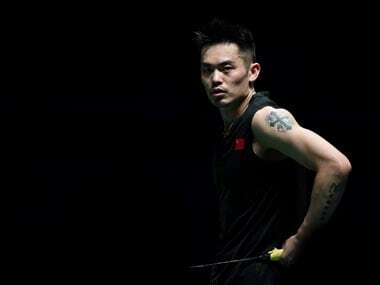 The once sky-high popularity of the tattooed shuttler — it is rare for Chinese athletes to have tattoos — has never recovered fully despite Lin apologising in November last year for an affair with a model while his wife and former badminton starlet Xie Xingfang was pregnant. Observers said Lin showed his advancing years had slowed him in the defeat to world number three Axelsen. "We all hoped to see Super Dan continue his legacy, but objectively speaking there's a 10-year age gap between the two players, think about the extra effort that has to be put in," commentator Tong Kexin said on state television after the defeat. Many people expected Lin to retire after last summer's Rio Olympics, where he surrendered his title and lost the bronze-medal match to Axelsen. But a reply Lin gave to Chinese media offers an insight into why he continues to defy expectations. Asked in 2014 what he would say in a retirement speech if given only one minute, he answered: "I would say 'I don’t want to go' and repeat it for 60 seconds."